The Delirium of Grandeur is a raucous group of pre-wreckage salvage engineers (to be read as: Airship Pirates) who have been active in the steampunk community since 2005. 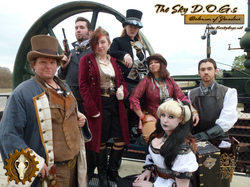 The Sky D.o.G.s tell tall tales, sell the salvaged swag of sunken ships, lecture and love alliteration. Everyone on board is a Captain, everyone in the crowd is a friend, and everyone richer than them is a potential target.